Joint ROM and Accessory Movements are critical to a healthy shoulder. Normal ROM at the shoulder is the goal with early emphasis on External Rotation (ER). 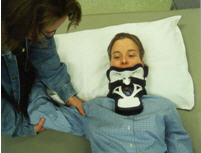 ER with the shoulder positioned at 0º Abduction and positioned at 90º Abduction should approach 90º of external rotation. In the authors’ clinical experience, patients with less than 60º ER tend to have a higher prevalence of shoulder pain. Scapular mobility is also critical to maintain or improve, as adhesions can develop quickly. Scapular mobilizations should be performed prior to shoulder ROM. During External Rotation at 0º Abduction, end range will be determined first by shoulder internal rotation (IR) muscles (subscapularis), then the capsule. During External Rotation at 90º Abduction, end range will be determined by first by joint capsule, then the shoulder IR muscles. Patients with tetraplegia are also at high risk for capsular tightness, especially anteriorly and inferiorly (secondary to arms resting at sides or across chest). The humeral head may also rest high in the glenohumeral joint (if patient tends to posture with shoulder and humeral head elevation). Joint mobilizations, especially at end range are an integral piece of the ROM program.